My name is Farideh Goudarzi. I am a supporter of the People’s Mojahedin Organization of Iran (PMOI). I left my country two months ago. I became acquainted with the PMOI in the course of the anti-monarchical revolution. I was arrested in the summer of 1983 and spent five and a half years in Hamedan’s Prison (western Iran). 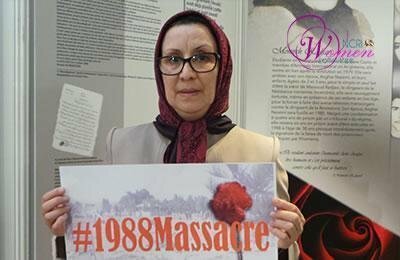 I am one of the witnesses of the 1988 massacre. I was arrested with my husband and brother in the summer of 1983. I was pregnant at the time of arrest and had a short time left before delivery of my baby. Despite my conditions, they took me to the torture room right after my arrest. It was a dark room with a bench in the middle and a variety of electric cables for beating prisoners. One of the people who was present during my torture was Ebrahim Raisi, then chief Prosecutor of Hamedan and one of the members of the Death Committee in the 1988 massacre. Fifteen days later, I gave birth to my son, Iman, while I was in terrible physical and psychological conditions. After my child was born, they transferred us to solitary confinement. Those were such horrible days as I had to undergo several interrogations everyday with my newborn child. Sometimes I had to feed my child only with water and sugar for 48 hours. And he was very sick. The silence of the solitary ward was too frequently shattered with the cries of my son, Iman, which created stress for other prisoners, as well. Six months passed before my family were informed of my arrest. Since I was on the death row, I gave my son to my family during one of the visitations. The moments of separation of my child were truly bitter, as he did not want to be separated and was screaming and crying. Later, I heard that he had become really sick and the doctor told my family to get a piece of my clothing to calm down my son. My husband, Behzad Afsahi, was hanged in June 1984 after enduring much torture. And my sister, Fariba Goudarzi, was slain in the Eternal Light operation by the regime’s mercenaries. In 1988, I was in solitary confinement in the IRGC prison under torture for three months, and I was unaware of what was going on outside. Later, I heard that every night the prisoners were taken for execution and all relocations were carried out quietly and under special security conditions. My brother, Parviz Goudarzi, was among the first victims of the 1988 massacre in Hamedan. After three months, when I came out of the solitary confinement, I found that many of the prisoners had been executed. When my family went to the court to ask about my brother’s situation, they met a large number of families who had also come to ask about their children and were told that their children had been executed. Throughout the years after my release from prison, I lived under harsh security conditions created by the regime, and we never enjoyed social rights. My son, Iman, was also arrested for being a PMOI sympathizer. So, after he was released, we decided to leave Iran and we are now here with you. At this moment, I would like to thank you for the Justice Seeking Campaign for the victims of the massacre. You are the voice of all bereaved families and the right answer to their pains and sufferings. I have come here to join the Justice Seeking Movement for the 120,000 victims of executions, including my brother, sister, husband and best friends. With your call, we are now strong enough to seek justice for our loved-ones, until every one of the criminals of this bloodthirsty regime are brought to justice.